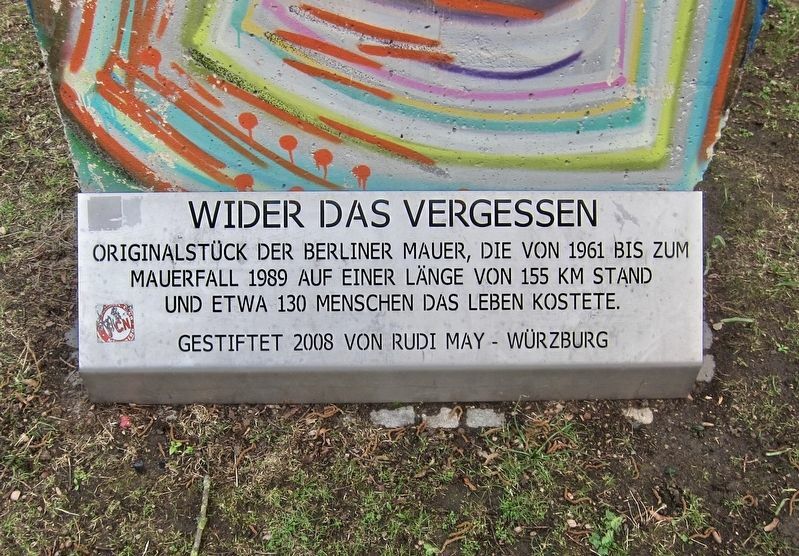 An original piece of the Berlin Wall, which from 1961 until its fall in 1989 ran a length of 155 kilometers and cost approximately 130 people their lives. Donated by Rudi May of Wuerzburg in 2008. Location. 49° 47.95′ N, 9° 56.55′ E. Marker is in Würzburg, Bavaria. 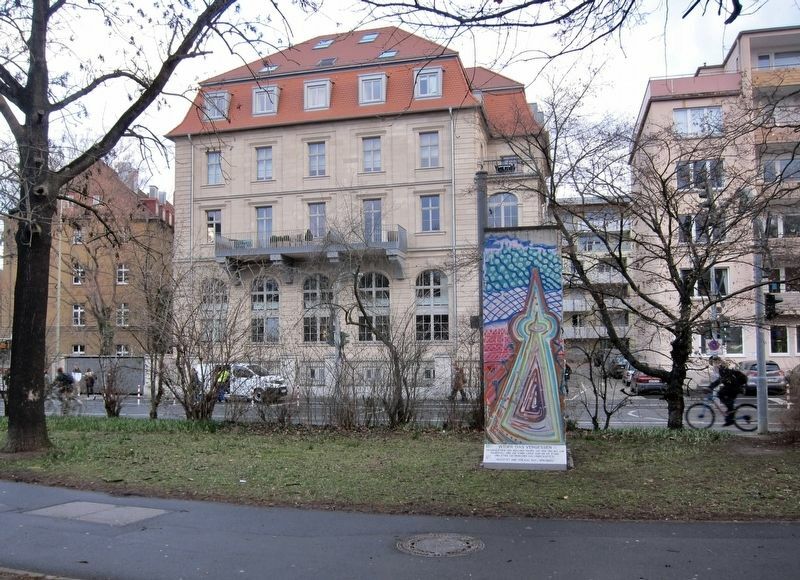 Marker can be reached from Berliner Platz. Touch for map. Marker is in this post office area: Würzburg, Bavaria 97080, Germany. Touch for directions. Other nearby markers. At least 8 other markers are within walking distance of this marker. Theodor Drey (approx. 0.4 kilometers away); Hannsheinz Bauer, 1909 - 2005 (approx. 0.4 kilometers away); John Millington Synge, 1871-1909 (approx. 0.4 kilometers away); Helena Petrowna Blavatsky (approx. 0.4 kilometers away); Adolf Eugen Fick (approx. 0.4 kilometers away); Altersheim "Hueberspflege" / "Huebers Care" Senior Home (approx. half a kilometer away); Matthias von Lexer (approx. half a kilometer away); Balthasar Neumann (approx. half a kilometer away). Touch for a list and map of all markers in Würzburg. More about this marker. The memorial is located in the green park-like area between Berliner Platz and the 7-way traffic circle directly to the south of it. More. Search the internet for Berlin Wall Memorial. Credits. This page was last revised on March 21, 2019. This page originally submitted on March 21, 2019, by Andrew Ruppenstein of Sacramento, California. This page has been viewed 54 times since then. Photos: 1, 2. submitted on March 21, 2019, by Andrew Ruppenstein of Sacramento, California.